Meet the local farmers who feed America—in stories, photos, and 50 recipes! When Forrest Pritchard went looking for the unsung heroes of local, sustainable food, he found them at 18 exceptional farms all over the country. With more than 50 mouthwatering recipes and over 250 photographs, this unique cookbook captures the struggles and triumphs of the visionary farmers who are Growing Tomorrow. Forrest Pritchard is a full-time organic farmer who holds degrees from the College of William & Mary. His farm, Smith Meadows, was one of the first “grass-finished,” free-range endeavors in the country, and has sold at leading farmers’ markets in Washington, D.C. for more than fifteen years. 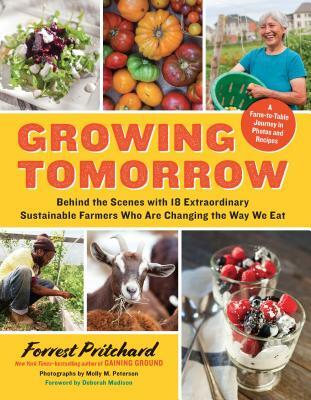 Pritchard is the author of the New York Times-bestselling book Gaining Ground: A Story of Farmers’ Markets, Local Food and Saving the Family Farm, picked as a top read by The Washington Post, Publishers Weekly, and NPR’s The Splendid Table. The primary blogger for the Facebook page “I Support Farmers’ Markets,” the largest online farmers’ market fan page, he is also a popular public speaker, having given addresses at RAND, Texas Organic Farmers Association, and Weston A. Price International, among others. Pritchard lives with his family on Smith Meadows in Berryville, Virginia. Molly McDonald Peterson has been a professional photographer for more than ten years, from the mountains of Aspen to the Virginia Piedmont. As the former director of photography for two regional food publications that celebrate local and sustainable food and farmers, she was a two-time finalist for the American Society of Magazine Editors’ annual “Best Cover” award. Molly is known for her food and farm shoots, and has contributed to multiple cookbooks, which she finds amusing since she used to think pancakes came from a box. She lives with her husband Mike, a chef-turned-farmer, in Sperryville, Virginia, where they raise pasture-based livestock on nearly 600 acres of leased land at Heritage Hollow Farms. “It’s so important—and so interesting!—to meet the people who grow the very best food in our country.